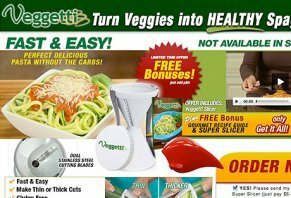 Veggetti Reviews - Is it a Scam or Legit? Billing itself as a healthier alternative to carb-heavy spaghetti, comes Veggetti. This handheld device claims you can cut vegetables such as zucchini or carrots into long, thin strips that resemble traditional pasta, but have less calories. Veggetti is sold by Ontel Products, Inc., based in Fairfield, NJ. They are not BBB Accredited and they currently have a C rating, due to hundreds of complaints within the last 3 years. The website itself is “powered by” Liquid Focus, which is also not BBB Accredited and has an F rating. Veggetti is a hourglass-shaped device with 12 stainless-steel blades on both ends. You stick in your favorite long-and-thin veggie like a carrot and twist. Essentially, you are “peeling” the vegetable: one end offers thinner strips, and the other thicker. Once cut, it says you can boil like pasta and serve with your favorite sauce as well as make things like salads, garnishes, and hash browns. You can order Veggetti for $14.99 plus $6.99 S & H plus $1 “Web Service Fee” for a total of $22.98. If you want the “free” Super Slicer, add $6.99 for S & H for a total of $29.97. If you don’t like the product, return within 30 days (you pay for shipping) and get your money back, minus original S & H and WSF. Ontel Products may use your information to contact you “for marketing purposes, shared with other organizations to help them contact consumers by email and/or telephone for marketing purposes.” You may also opt-in for other third party services, and may cancel those by sending an email. Bottom Line: Is Veggetti a Scam? First of all - you are not making “spaghetti” with this device. You are merely slicing vegetables to RESEMBLE pasta - you will not be fooled when you take a bite. That said, there is always a case for eating healthier, and this may increase you and your family’s vegetable intake. But because of Veggetti’s high cost and the lousy BBB ratings, it’s not worth it. I got my Veggetti for Christmas. I took it out of the box, tried it, and it broke. This is the first appliance that I have that I can truly say is not a good one. So disappointed. Don’t purchase. My parents bought me this for Christmas. I am not a big fan of cutting veggies, so I love this contraption. It makes cooking so much easier and faster. When I serve stir fires to guests, they think the carrots look super fancy. Both my partner and I cut our hands up using this piece of crap. It doesn't work for sweet potatoes or zucchini. This is the most ridiculous waste of money. Make sure you get a tetanus shot before using this garbage. If there is a class action lawsuit, please contact me kwander777[at]hotmail.com. Love it! Young squash works best. Young Zucchini lightly stir fried in EVOO is supreme! Add chopped olives, mushrooms, onions and sauce. Low and almost no carbs, healthy alternative to pasta. This gizmo is awkward to use, a good third of the vegetable cannot be sliced because of the design, the veggies jam and the "pusher" or "Gripper" is of little help in holding the vegetable. The metal clip that holds the blade is not protected in any way so it is easy to cut yourself on this before you even notice it is there. I found this product difficult to use. I thought the blades were dangerous as the finger guard cannot be used effectively when 'spiraling' your vegetables because it doesn't hold the vegetable in place and you end up not using it at all. Even when you do, a lot of the vegetable is wasted. Also, I found it difficult cleaning the product as it's very sharp. I scratched and nearly cut myself, despite being very careful. All in all, I would not recommend this product and I am taking mine back to the shop. I do not understand the negative reviews, because it does exactly what it's supposed to do. I have used it for over a year, with no issues. I don't know what you people could be doing wrong, because it works great, and the squash that I'm not able to use just gets diced for the next day. I have the Pro model, and used it yesterday to make butternut squash noodles. The squash I used was very hard, so it took some effort to turn the handle, but well worth it. I cooked it briefly in a frying pan, with a little olive oil, and then topped it with low sodium pasta sauce, and the result was excellent! Throughout, our Veggetti was a waste off money. Our mixer with our extra connections has done a better job, without any waste and it doesn't matter the size or shape of the product you put in it. Wouldn't recommend Veggetti. I love cooking and have been enjoying making gourmet recipes for many years. This is absolutely the worst kitchen gadget ever, it does not do what it says with any ease at all. I just tried it on a sweet potato and you have to be GodZilla to turn the potato after you finally shave it down to fit the hole. I am returning it to the store and demanding my money back. I have never reviewed anything, but this time I had to. The little simple device has made my clean eating so much more enjoyable. It really is simple and so far cuts zucchini perfectly. It is a little tricky to clean though. I just bought mine so I am uncertain how long the blades will stay sharp and if cutting sweet potatoes will be labor intensive, but the one dinner was such a treat it was worth it right there. I bought one as a gift and I'm proud and excited to give it away after using mine. Man, why didn't I think of this invention? Write a Review for Veggetti!